For Josh Reichard, poker has always been a family affair. The 25-year-old poker pro is steadily climbing the all-time ring list on the World Series of Poker Circuit and won his sixth career ring last week at the Potawatomi Hotel and Casino in Milwaukee. 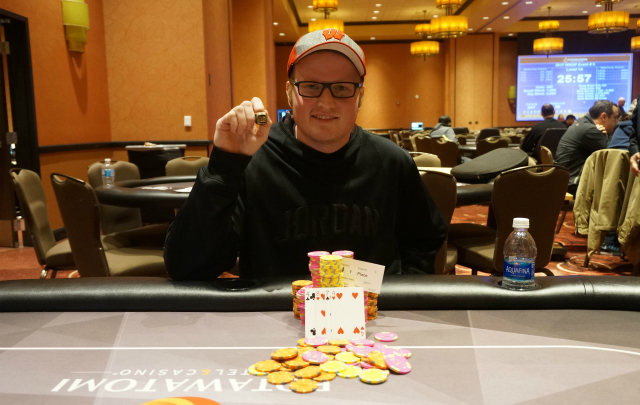 The Janesville, WI native won the $365 Pot Limit Omaha event to earn $17,021 and him enough Circuit rings for two hands. But poker doubles as both a career and a way to spend time with his father. Reichard learned the game from his dad, Brett, as a young child. Poker was a game that his entire family would take part in, but the father-and-son duo took it to another level. Reichard began learning the basics of his game when he as young as eight years old in the aforementioned family games. As he got older, he started taking the game more seriously. He was too young to play during the glory days of online poker, but he would sit next to his father while he played online. The two would talk strategy and Reichard quickly honed his skills by sweating his dad. Once Reichard was old enough to play in games outside of the living room, they began to play local tournaments in town. After he graduated from high school, Reichard began working for his father’s property preservation company, which was responsible for cleaning out foreclosure properties for banks and realtors. He’d spend his weekdays working, but when he had an off-day from work, the two would get back on the road to find a poker tournament to play in. Once he was legal in all 50 states, Reichard stopped working for his father’s company and took on poker full time. It’s been a successful ride for the two of them. While Reichard is making a name for himself on the Circuit, his father was improving as well. Last August, Brett Reichard won his first ring in $580 No Limit Hold’em event at the WSOP Circuit stop in Cherokee, North Carolina. He earned over $32,000 for the win, which was his biggest of his career and brought his total earnings to over $152,000. Over the course of his pro career, the younger Reichard has amassed over $530,000 in tournament earnings to go along with his six rings and a Mid-States Poker Tour title. He is just three rings away from tying Alex Masek atop the all-time leaderboard and is quickly putting himself in elite company on the Circuit. Some players have used the Circuit as a springboard to bigger success. However, Reichard always sees himself as part of the Circuit community. He enjoys the environment that the Circuit brings to its venues as opposed to some of the bigger buy-in events. “I’ll probably move on a little bit, but I’m always going to play the Circuit no matter what happens,” said Reichard. “I enjoy the players on the Circuit. I haven’t played that many WPTs. I’ve played a couple and one was actually really fun. But most of them, all the players were kind of robotic and there wasn’t much talking or anything like that. His preference for the Circuit doesn’t mean that he can’t compete with the players on the WPT. During last year’s Bay 101 Shooting Stars, Reichard earned a bounty for knocking out Kelly Minkin, one of the Shooting Stars at the event. He didn’t cash the event, but it isn’t stopping him from heading back out for another shot at it. At the end of the month, he is going to head back out to California to play all three legs of the WPT California swing. He’s optimistic about his ability and his chances, but regardless of the outcome, Reichard is coming back to the Midwest. Reichard has accomplished a lot in his young poker career, but he lacks the big, six-figure score that could turn him into a household name. He’s realistic about his chances of hitting it big in in the Golden state, but he feels that the best chance for one of those could be this summer at the Rio. The 2016 WSOP was the first time that Reichard stayed out in Vegas for the entire seven-week tournament series. Outside of a one-week trip back home, he was out in the desert searching for a deep run in a bracelet event. During previous summers, he would make multiple one or two-week trips back-and-forth from Wisconsin. It wasn’t that he didn’t want to spend more time in Vegas, but he’s got a wife back at home in Wisconsin. The two met in high school and started dating 10 years ago before getting married a few years ago. It’s with the support of his loving wife that Reichard can maximize his results, focus on poker, and work on taking his career to the next level. nice article, good luck in california next month!